Kevin Harvick, driver of the No. 4 Stewart-Haas Racing Chevrolet, battles the No. 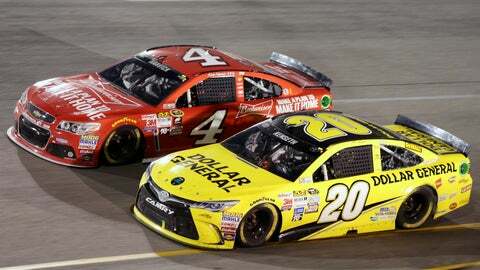 20 Joe Gibbs Racing Toyota of Matt Kenseth in a race earlier this year. If you’re Joe Gibbs Racing there are three goals for Sunday’s AAA 400 at Dover International Speedway. The first two are to keep the team’s winning streak alive and make sure Kyle Busch advances to the Contender Round of the Chase for the NASCAR Sprint Cup. Those two goals make total sense: JGR has won the last four Cup races, five of the last six and 10 of the last 13. For the year, the team has taken 13 of 28 races run. Now that the Chase is here, JGR understandably wants to stay hot. With JGR drivers Matt Kenseth and Denny Hamlin already locked into the Contender Round no matter where they finish on Sunday and Carl Edwards nearly a sure bet to make it based on points, of course the team wants Busch to transfer in, too. If Busch advances that means four of the final 12 Chase drivers would be JGR pilots, which would give the team a strong leg up in the stretch run for a championship. But there’s another subtler goal for Sunday: Make sure Kevin Harvick doesn’t make it into the next round. After stumbles in the first two Chase races, Harvick comes into Dover 15th in points and will probably need a win on Sunday to advance. At the very least, Harvick needs a top-two or top-three finish and to have several cars ahead of him in points have big issues. That’s possible, but not likely. A win would lock Harvick into the Contender Round, and with the points reset after every round, Harvick would suddenly be very much in the title discussion again, as he would instantly go from the verge of elimination to being tied in points with 11 other drivers. Despite JGR’s recent dominance, which has been impressive, Harvick is the one non-JGR driver who’s had a standout season. Harvick has led 1,676 laps this season; no one else has led more than 863. Harvick set a record for Sprint Cup regular-season points, he has 12 top-two finishes, leads the series in top fives (18) and is tied for the lead in top 10s (22). More than that, though, Harvick, crew chief Rodney Childers and the entire No. 4 Stewart-Haas Racing team are battle tested, having won a championship last year under intense duress. To take the title, Harvick had to win the final two races of 2014 and he did just that. And the competition knows how good they are. "They are going to have 42 others out there trying to prevent them from winning this race and that is certainly going to be a challenge for them," four-time champion Jeff Gordon said of Harvick and his team. "I think you have to understand that everyone in this Chase knows that they are the biggest threat for the championship and if they get eliminated then that takes the biggest threat out of it. So Kevin and that team are going to be working hard and all the other teams are going to be working hard to win this race and potentially eliminate one of the biggest threats." After Harvick, the pickings for non-JGR drivers to make a championship run are slim. The Team Penske Fords of Joey Logano and Brad Keselowski have had speed and consistency, albeit not at JGR levels. The Hendrick Chevrolets have been a total non-factor since Dale Earnhardt Jr. won at Daytona International Speedway in July. The best of the rest could be Harvick’s SHR teammate, Kurt Busch, who’s had a great 2015 campaign. So the bottom line is that Sunday’s AAA 400 will be a race within a race, or maybe even several races within races. Can JGR stay red-hot and close in on its first championship since 2005? Can Harvick keep his drive for a second straight title alive? Can Busch the younger make it four JGR Toyotas in the final 12? Can Earnhardt hang on and advance? Will Gordon make it to the next round in his final Chase before retiring as a driver? Right now, all we have are questions. Sunday afternoon, we’ll start getting some much-needed answers.